So you’ve seen all the stories (like this one) about some prisoner in South Carolina filing a lawsuit claiming that I hired OJ Simpson as a hit man, among other things. 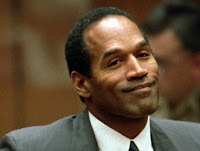 Fact is, I have met OJ, but not in the context of hiring him to kill people for me. I’ve hired him as an acting coach. And I’ve been working with some of his defense team in preparing my own testimony in the options backdating case. At this point we’re still hoping to kill off this subpoena where they want me to testify against Nancy Heinen. But if we can’t kill it and I have to go talk to them, I want to be ready. So I’ve been working with some of the old OJ team. Who better, right? I mean they had the guy dead to rights, and he walked. Amazing. I’ve also been doing some mime work and facial gesture work with OJ himself, trying to perfect that expression where you look kind of baffled and befuddled and confused, but also confident and unafraid, likeable and pleasant, and sometimes hurt and indignant and a little bit angry but not so angry that you scare the jurors. OJ had all that movie acting background which helped him tremendously. He’d been working with acting coaches for years on his Nordberg character. I can’t comment too much on our work together but I can say that during all of our meetings OJ has been a complete gentleman and a total professional. We start out with some easy mime stuff, just facing each other and “walking down the glass,” and then we do some physical stuff like “walking into the wind” to loosen up before we get into the serious facial work. There are something like fourteen thousand muscles in the face and a pro like OJ can control them at this incredible level. It’s kind of amazing to see him work. These sessions last an hour and afterward I’m just drained. It’s exhausting work. So much concentration.